December 11, 2016 – With research expeditions to Antarctica, Greenland, Iceland and Mount Everest already under her belt, alumni Ulyana Horodyskyj was no stranger to harsh and isolated environments. But for a moment on September 19, she wondered if she’d met her match. 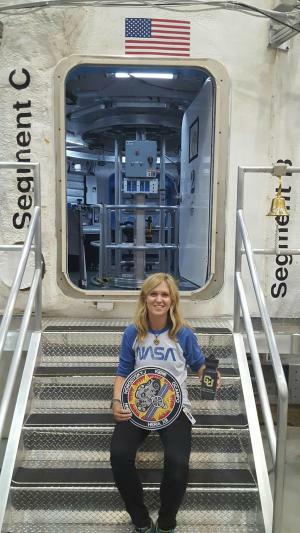 That day, Horodyskyj climbed inside a windowless 636-square-foot pod housed in a warehouse at NASA’s Johnson Space Center, switched off her phone, high-fived the three strangers she’d be spending the next 30 days inside with, and watched the doors shut tight. This fall, Horodyskyj served as commander of the Mission XII crew of NASA’s Human Exploration Research Analog (HERA) project, a multi-year endeavor to study just what happens to people’s bodies, brains and psyches when they’re isolated inside a confined space for long durations with other adults. The project aims to simulate what it might be like for astronauts traveling to and from Mars or an asteroid – journeys that could take years. NASA has so far selected 48 healthy volunteer test-subjects endowed with “astronaut-like” qualities (physical fitness, emotional resilience, teamwork and leadership skills) for mock missions in which they were videoed and monitored round-the-clock. Campaign 3 was a confined isolation study focused on psychological, health and cognitive impacts, and using blood and saliva tests, surveys and other measures to assess response to stress. Horodyskyj, who has conducted research at 22,000 feet and once spent three frigid weeks hunkered down in a tent with two other scientists on Canada’s Baffin Island, seemed an ideal fit. “She brings unique life-skills with her that we thought would be applicable to this project,” says Patrice Yarbough, PhD, principal investigator for HERA Campaign 3. She spent 16-hour days working much like an astronaut would – studying hydroponic plants, practicing flight maneuvers via virtual reality, and staging mock landings and takeoffs. She was banned from all email or social media and had no contact with the outside world, aside from regular briefings with their mock “mission control” and the rare pre-scheduled call home. On occasion, the real world would make its presence known. At another point, the team was kept awake for 39 hours for a sleep deprivation study. That too was a low point. She also missed blue skies, mountain air, running and – she admits – Facebook. After earning degrees from Rice and Brown universities, Horodyskyj came to CU in 2011, drawn by a fellowship with the Cooperative Institute for Research in Environmental Sciences (CIRES) and the chance to have famed Himalayan earthquake researcher Professor Emeritus Roger Bilham as her PhD advisor. For her glacial lakes research, she made multiple trips to Nepal, taking samples on Mount Everest and launching the Sherpa-Scientist Initiative, a citizen-science initiative, aimed at teaching Sherpas how to do field science. (The program is expected to be featured in the “Crowd and the Cloud” series on PBS in Spring, 2017). She has worked on all seven continents. But her time inside HERA broadened her perspective even further, she says. She’s now waiting to hear back about the Astronaut program. And she has launched her own company, Science in the Wild, LLC, which takes ordinary citizens on science expeditions in uncharted places.